Needless to say, California is not happy that the Department of Justice is suing them, rightfully, over their obnoxious sanctuary state law. That law into effect this year. It reached some tense moments when Attorney General Jeff Sessions tore into Oakland Mayor, Libby Schaaf, who recently warned her residents about scheduled ICE raids. Lt. Gov. Gavin Newsom (D-CA) called the director of U.S. Immigration and Customs Enforcement (ICE) an “a plus prick” in an official government email obtained by NTK Network. Newsom, clearly aligning himself with Brown, is running to replace the governor in November in an incredibly crowded field. Other Democrats running include Los Angeles Mayor Antonio Villaraigosa, state Treasurer John Chiang, and former Hillary Clinton staffer Amanda Renteria. The primary for that contest will be held on June 5. During his run for governor, Lt. Gov. 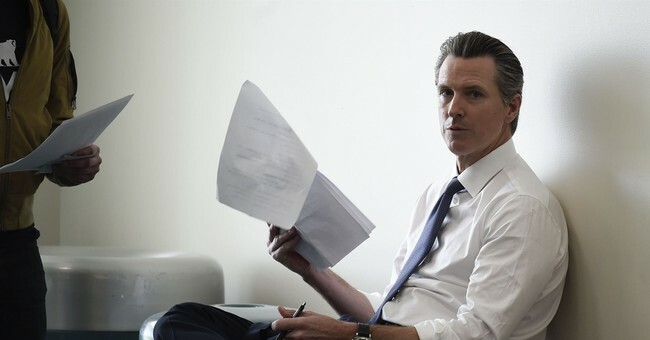 Gavin Newsom has said he’s proud to represent a “sanctuary state,” sparred publicly with Attorney General Jeff Sessions over immigration, and vowed he’d go to jail to protect undocumented immigrants. But a fight over sanctuary policy a decade ago when Newsom was mayor of San Francisco suggests that he wasn’t always as strident a defender of immigrant rights. In July 2008, Newsom imposed a city policy that reported undocumented youth arrested for felonies to federal immigration authorities. That decision — made the week after a father and his two sons were killed by an undocumented immigrant — meant that some kids were put at risk of deportation even if charges against them were later dropped. The San Francisco Board of Supervisors voted to overturn Newsom’s policy in 2009, mandating that minors could only be referred to Immigrations and Customs Enforcement if they were convicted of a felony. But Newsom’s administration simply ignored the board, continuing to turn juvenile arrestees over to ICE for the rest of his term. Meanwhile, according to emails obtained by the Bay Area News Group, Newsom’s administration also conducted a review of people in the city’s probation system and referred more than 350 suspected undocumented immigrants to ICE.